Arcane Item; Restrictions: None; but confers extra powers to female characters. A two-foot long segment of blackthorn terminating in a clubbed gnarl, a crude face has been gouged into the cudgel’s head, its contours weathered from years of cracking skulls. Below this are carvings of a shamrock, a rough Irish harp, and a series of notches signifying Gallus Mag’s victories in battle. The shillelagh’s handle is carved with Celtic knot-work, and equipped with a rawhide thong for better purchase. This cudgel was owned by Gallus Mag, one of the infamous harridans of the Five Points. A six-foot tall woman of ferocious mien, she acquired her nickname because she used galluses—buttoned suspenders—to keep up her skirt. Liverpudlian Irish by descent, Mag arrived in New York amidst rumors of blackmail, piracy, and murder. She became the bouncer of a waterfront dive known as the Hole-in-the-Wall, a miserable den of iniquity owned by Charles “One-Armed Charlie” Monnell. 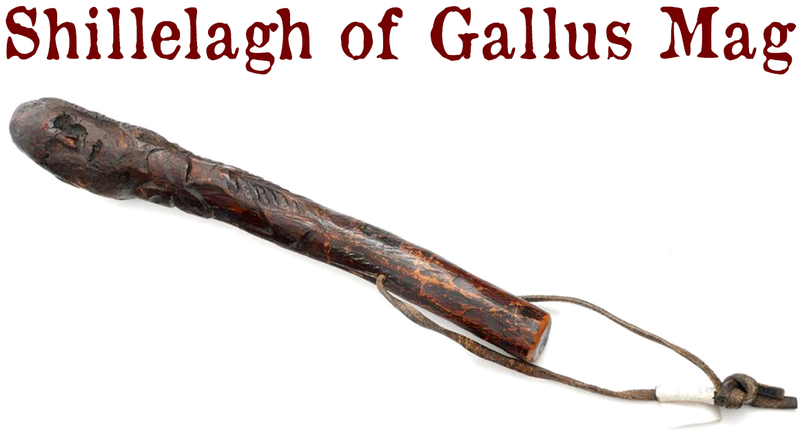 Gallus Mag kept the peace through generous application of this shillelagh, which hung from her belt along with a rusty Colt Navy revolver. Truly obstreperous patrons were clubbed into submission and dragged out by their ear, which was firmly clamped in Mag’s ungentle teeth. She kept a jar of pickled human ears on the bar as a testament to the ferocity of her bite, one of which she reportedly returned to a rival after they became friends. If the wielder of Gallus Mag’s shillelagh draws the Three of Clubs during battle, it may be treated like a Joker. The shillelagh inflicts 1d4+STR damage, but has the power of “progressive acing” on the d4 DAM die (not the accompanying STR die.) In other words, a roll of “4” on the d4 DAM triggers a d6 roll for bonus damage; if the wielder aces with a “6” on that, it advances to d8, and so on up to d100! (d4 > d6 > d8 > d10 > d12 > d20 > d100.) In the hands of a woman, the shillelagh confers an additional +1 to Parry. Gallus Mag is a delightful New York legend, charmingly described by Herbert Asbury in his Borges-approved masterpiece, The Gangs of New York. I am also indebted to Rick Spilman’s Old Salt Blog for his research into the “historical” Gallus Mag. In Martin Scorsese’s film Gangs of New York, Gallus Mag is named “Hellcat Maggie,” a composite character that combines the battle fury of the historical Hellcat Maggie with the penchant for ear-biting of Gallus Mag. Played by Cara Seymour, another inspiration for the character is the semi-mythical pirate Sadie the Goat—the enemy-turned-friend mentioned in Gallus Mag’s description above. According to folklore, after Mag returned her ear, Sadie wore it as a necklace. The shillelagh in the banner image is a “Late 19th Century Craved Blackthorn Shillelagh” borrowed from Whyte & Sons Auctioneers.